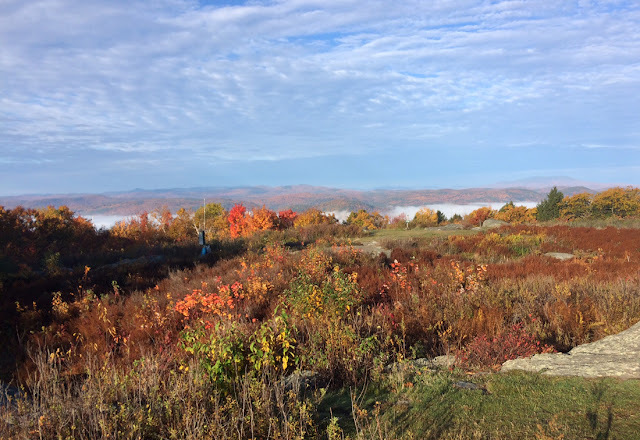 View from Putney Mountain, VT looking WNW. 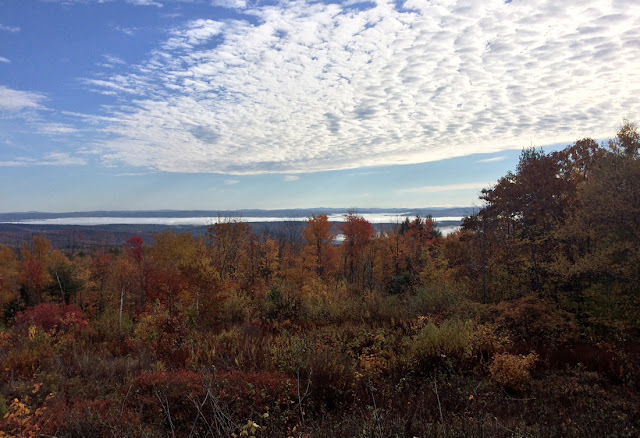 Sensing the need for change, I headed north toward Putney Mountain Hawk-watch in southern Vermont, my third such visit this fall. It was a glorious morning, but from a birding perspective, not quite as cool and blustery as I'd hoped, nor as cool as the weather forecast might have suggested. Even so, it was a thoroughly enjoyable visit and I was more than happy to share the morning with regulars JoAnne Russo, Laura Gaudette and Don Clark. View from Putney Mountain, VT looking East. View from Putney Mountain, VT looking North-east. 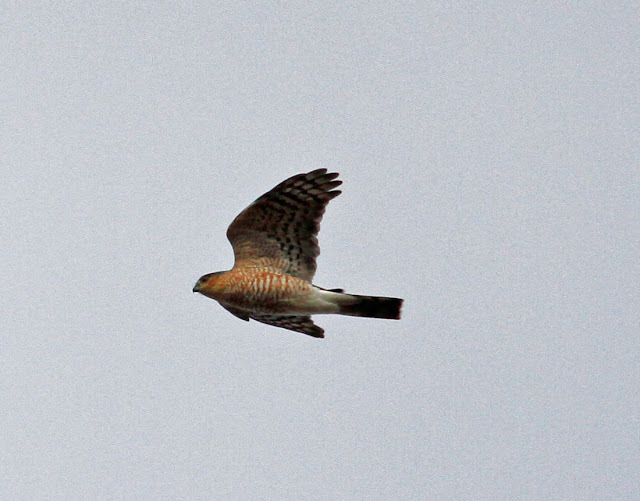 Raptors were few, very few in fact but a steady trickle of Sharp-shinned Hawks passed through in ones and twos, actually the only common raptor species for the morning. 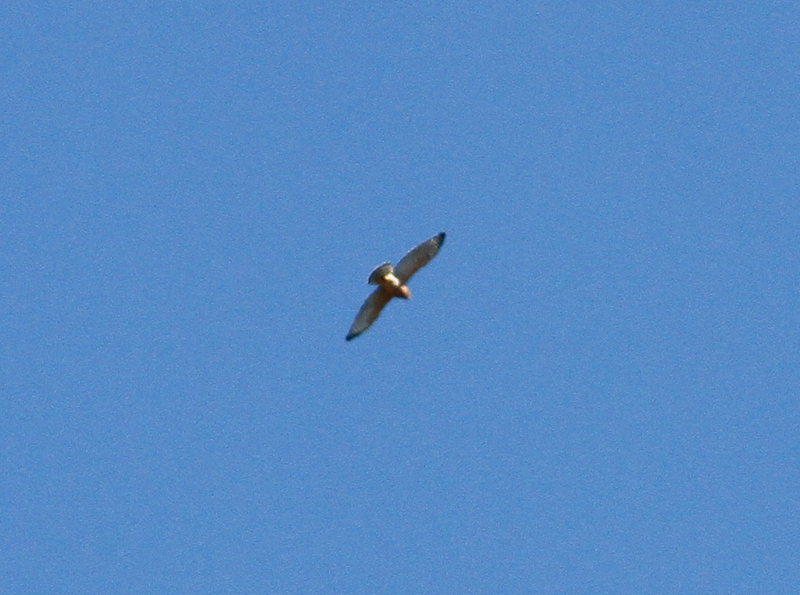 Otherwise, there was a smattering of Turkey Vultures and singles of Cooper's Hawk, American Kestrel, Merlin, Bald Eagle and my personal favorite, a Northern Goshawk (distant adult soaring with a Sharp-shinned Hawk). Sharp-shinned Hawk (adult male) - Putney Mountain, Windham Co., VT. October 20th, 2016. By comparison, passerine action was quite lively as small groups of American Robins and Purple Finches passed south through much of the morning, and there was even a small flock of Horned Larks that tried to settle on the mountain before moving on. Golden-crowned and Ruby-crowned Kinglets were also present, as well as several Yellow-rumped Warblers and a good looking yellow (eastern) Palm Warbler. 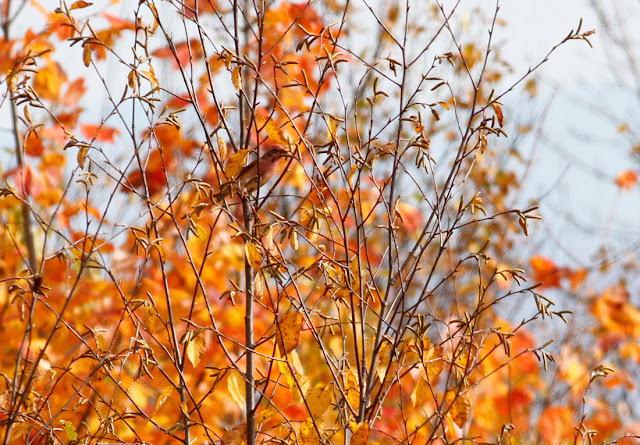 Purple Finch (adult male) - Putney Mountain, Windham Co., VT. October 20th, 2016. 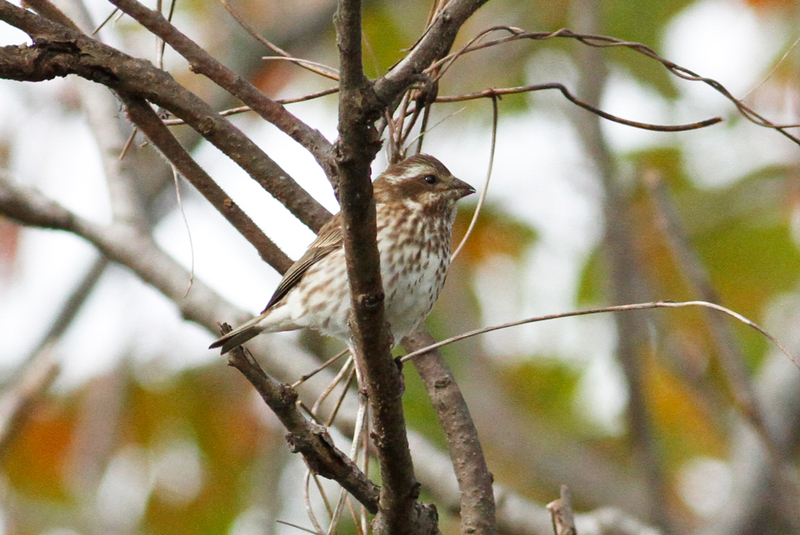 Purple Finch (female-types) - Putney Mountain, Windham Co., VT. October 20th, 2016. 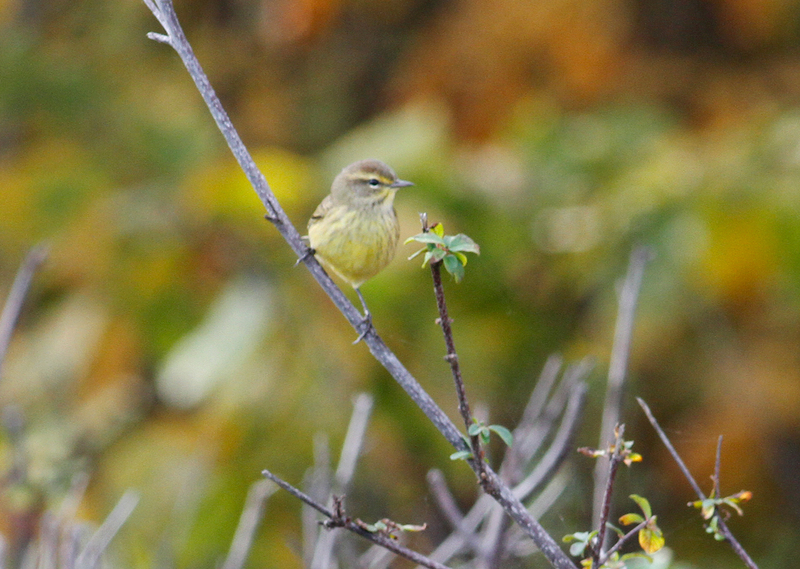 Palm Warbler - Putney Mountain, Windham Co., VT. October 20th, 2016. 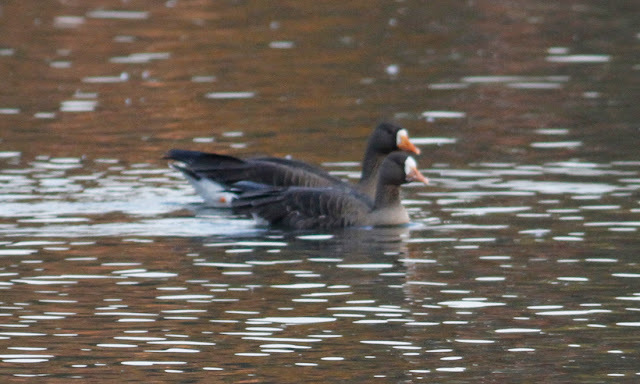 Greater White-fronted Geese (two adults) - Turner's Falls, Franklin Co., MA. October 18th, 2016. 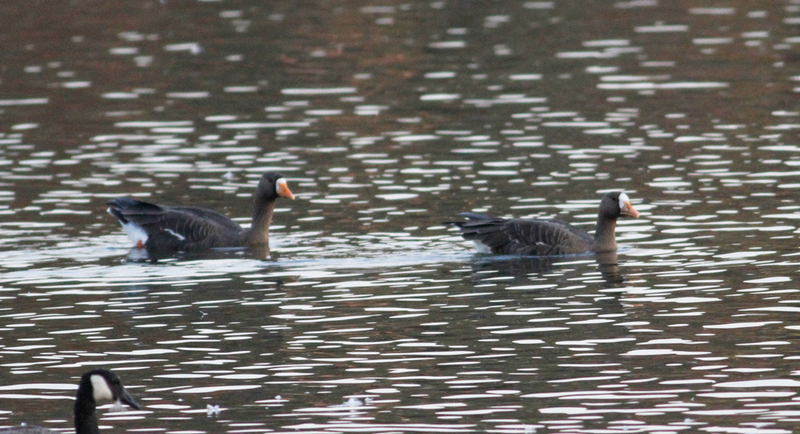 This evening I finally managed to get decent views of the two Greater White-fronted Geese present in the Turner's Falls area since October 10th. The birds were calm resting amid some 1200 Canada Geese on a lovely, warm autumnal evening. 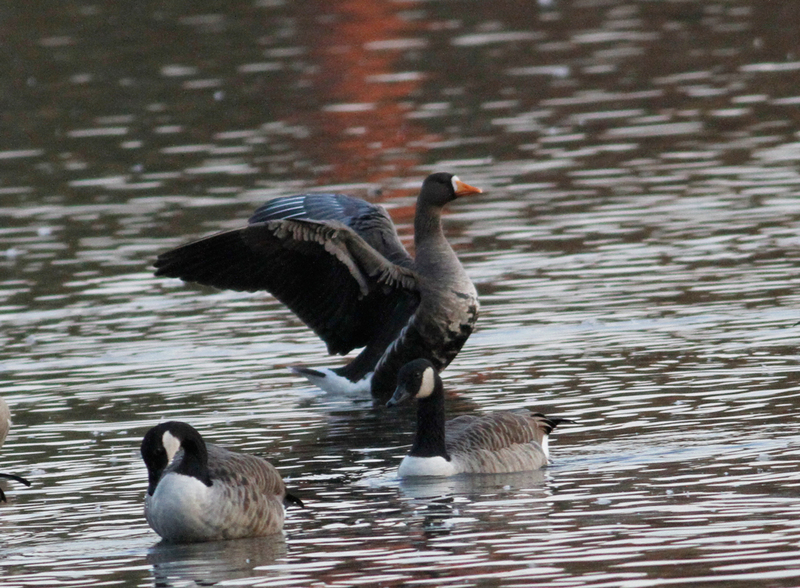 These were also the first really large numbers of Canada Geese that I've seen this autumn. 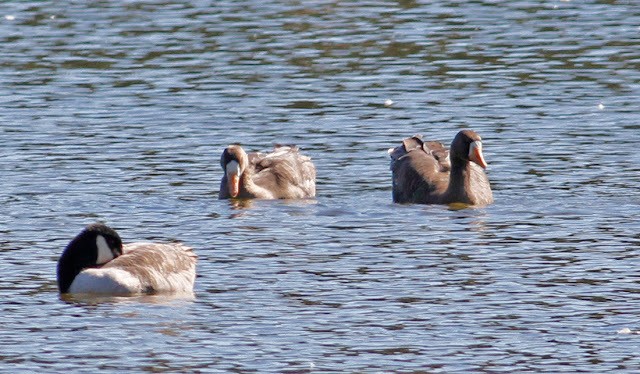 I've been naturally reluctant to attempt assigning the white-fronts to sub-species without having extended views in good conditions. 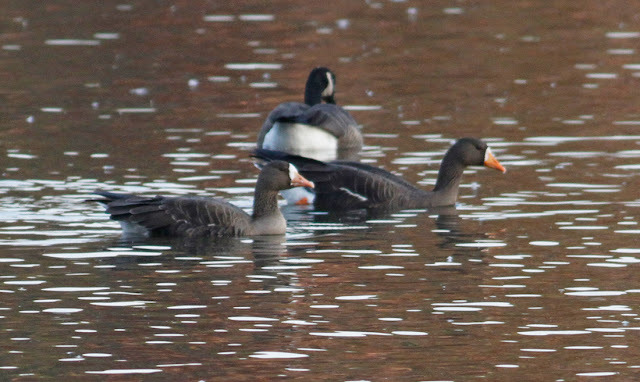 However, since one bird had already been seen to have a bright orange bill and dark, almost 'oily' brown plumage, I'd assumed that both would prove to be the Greenland form 'flavirostris', a scarce but now expected migrant through our region. 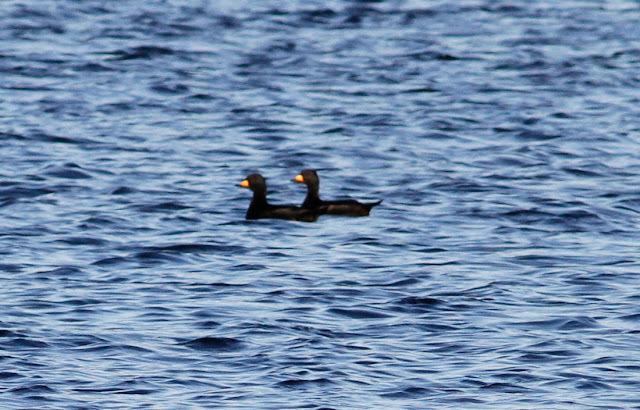 Since both birds were close together throughout the observation, differences in bill color as well as overall color, size and structure became apparent leading me to believe that perhaps two distinct sub-species had to be involved. One bird, the larger of the two, appeared to be a pretty good a example of 'flavirostris' with a bright orange bill closely matching the orange leg color, along with dark, 'oily' brown plumage and an obvious but somewhat restricted white 'blaze' around the base of the bill. The other bird looked consistently smaller, stockier and grayer (especially on the breast) with a much more striking white blaze around the bill riding higher on the forehead. 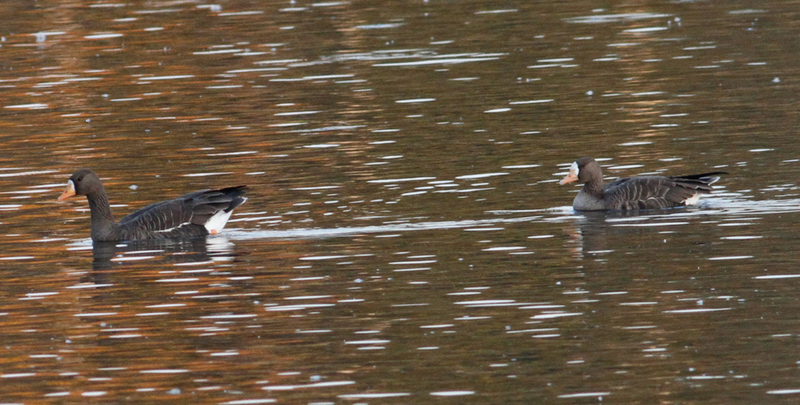 The difference in the distribution of white around the bill was obvious on both birds at all angles. Above all, the smaller bird had a distinctly pinkish rather than bright orange bill, again obvious at all angles even in low afternoon light. The differences were subtle but distinct enough to follow and sort out both birds with ease as they mingled among the Canada Geese. 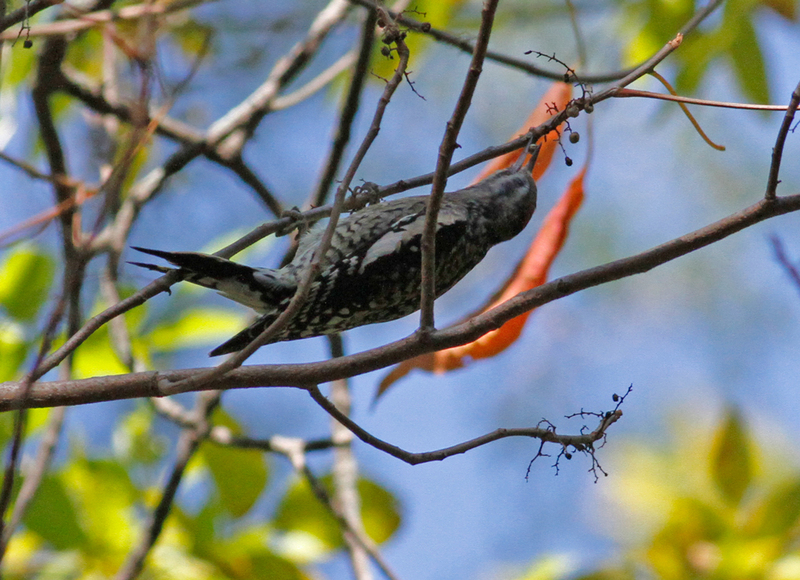 So, what to make of the smaller, pink-billed, grayer-breasted bird? Well, background reading should offer some insight but at the moment the features seem to be most suggestive of the 'Tundra' form 'gambelli/frontalis' or possibly, though obviously rather less likely, the European/Siberian form 'albifrons'. Greater White-fronted Goose (adult, Greenland form flavirostris) - Turner's Falls, Franklin Co., MA. October 18th, 2016. A beautiful fall afternoon saw Unity Park crowded with folks understandably enjoying some warm autumn sunshine at the end of a glorious day. Bird-wise it seemed very quiet to start with and my expectations were relatively low as I embarked on a sustained watch overlooking the Connecticut River above the Turner's Falls dam. But by the end of a 90 minute vigil I'd recorded a few species of interest, including two Greater White-fronted Geese, presumably the same birds first detected at the power canal by Eric Huston on the 10th. About 350 Canada Geese had been loafing around in Barton Cove during the entire time that I watched from Unity Park, yet despite thorough scope scanning, I failed to pick out anything of interest so I was more than a tad surprised when one departing group of Canada Geese contained two Greater White-fronted which proceeded to fly right over my head, vocalizing as they headed west at sunset. 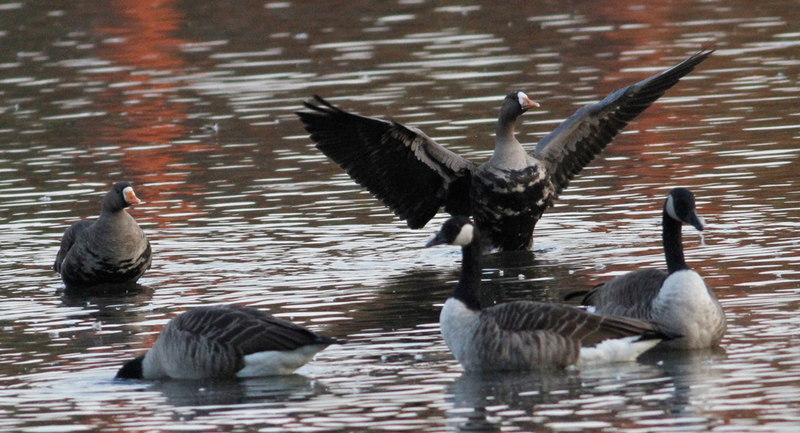 Greater White-fronted Goose - Unity Park, Turner's Falls, Franklin Co., MA. October 15th, 2016. 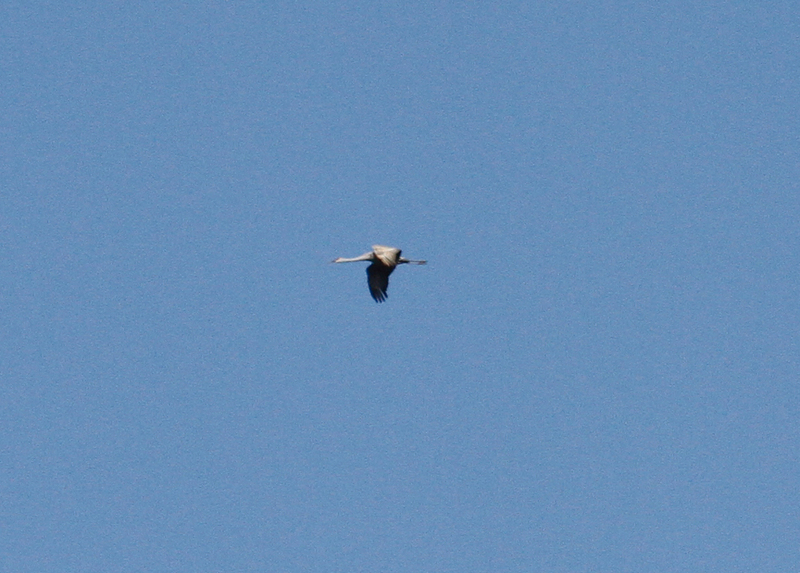 One of two birds passing directly overhead. Otherwise the species profile was very much composed of long staying, continuing birds including five Double-crested Cormorants, four Green-winged Teal, Pied-billed Grebe and American Coot, as well as three Belted Kingfishers. 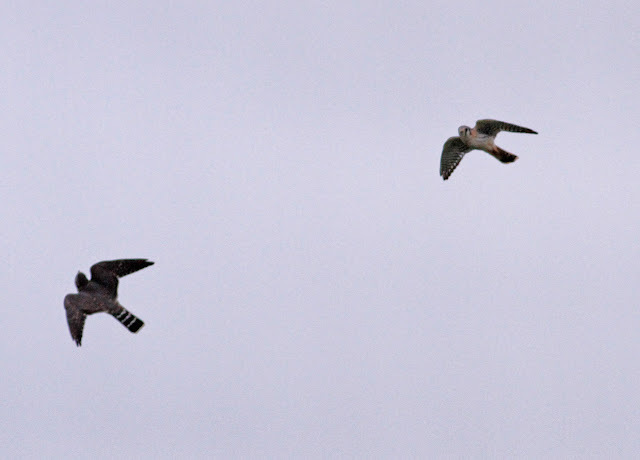 An adult Peregrine put in an appearance and the local male Merlin suddenly became very vocal when a second Merlin appeared over the cove with the two birds sparring together for a few seconds. Merlins - Unity Park, Turner's Falls, Franklin Co., MA. October 15th, 2016. 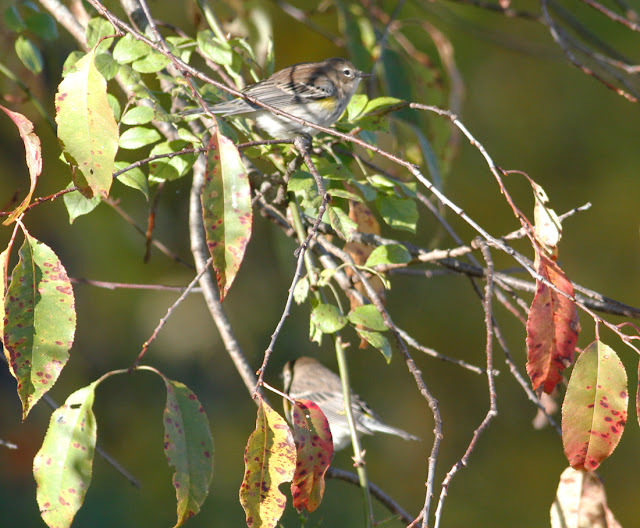 Not surprisingly for such a warm sunny afternoon, passerines were few but a small arrival of 25 Song Sparrows was certainly of interest, and with them a couple each of Swamp and Savannah Sparrows, both fairly unusual for Unity Park. 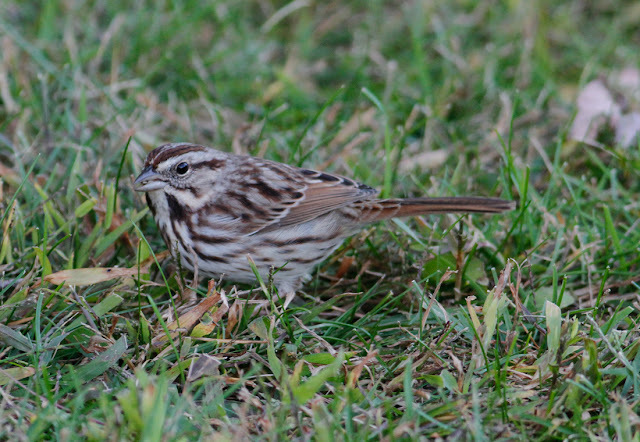 Song Sparrow - Unity Park, Turner's Falls, Franklin Co., MA. October 15th, 2016. Small arrival of about 25 along the river bank. 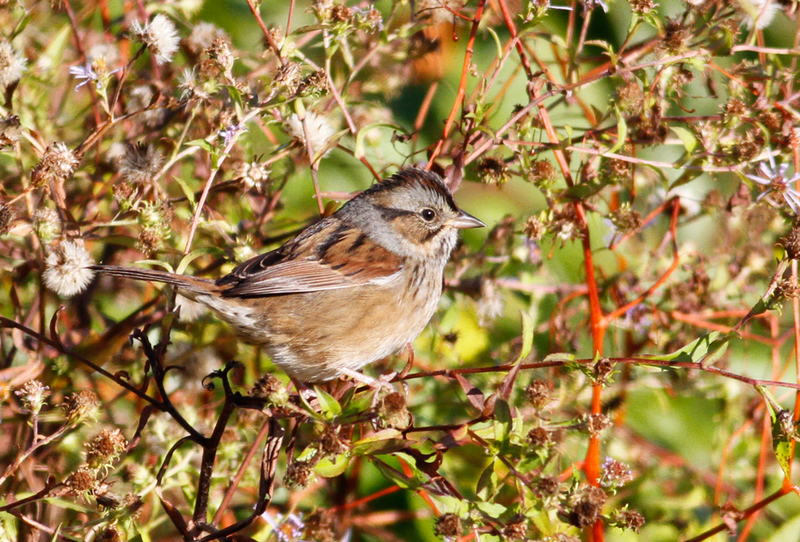 Swamp Sparrow - Unity Park, Turner's Falls, Franklin Co., MA. October 15th, 2016. 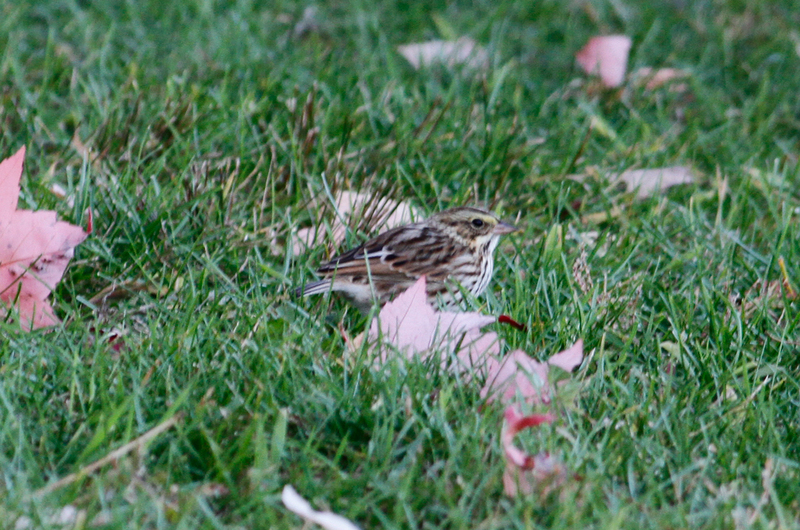 Savannah Sparrow - Unity Park, Turner's Falls, Franklin Co., MA. October 15th, 2016. Northern Harrier - juvenile, Caldwell Road fields, Northfield, Franklin Co., MA. October 12th, 2016. Back into warm southerlies for a few more days, especially in the afternoon. The mornings, however, usually start chilly and foggy. 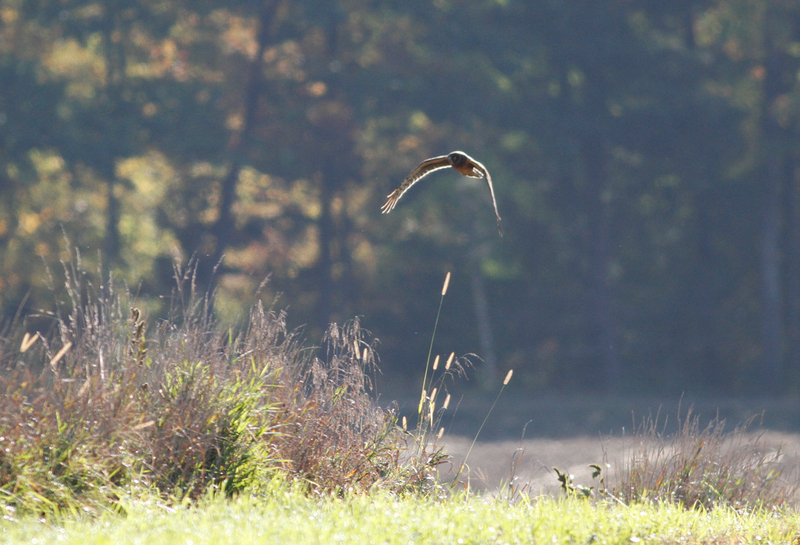 Spectacular numbers of birds continue in the fields around Gill and Northfield. On the 11th, I counted no less than 185 Yellow-rumped Warblers in a single pumpkin field off North Cross Road, Gill. 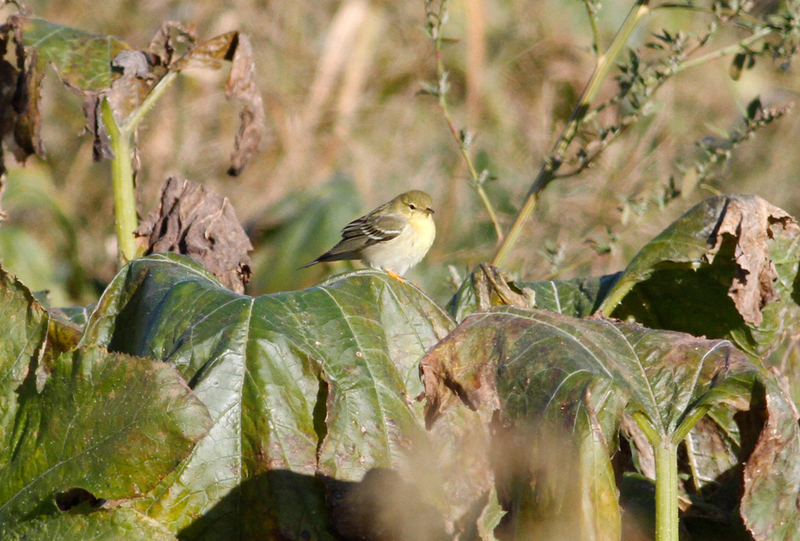 The field was literally heaving with them along with 20 or so Palm Warblers and a few Blackpoll Warblers. 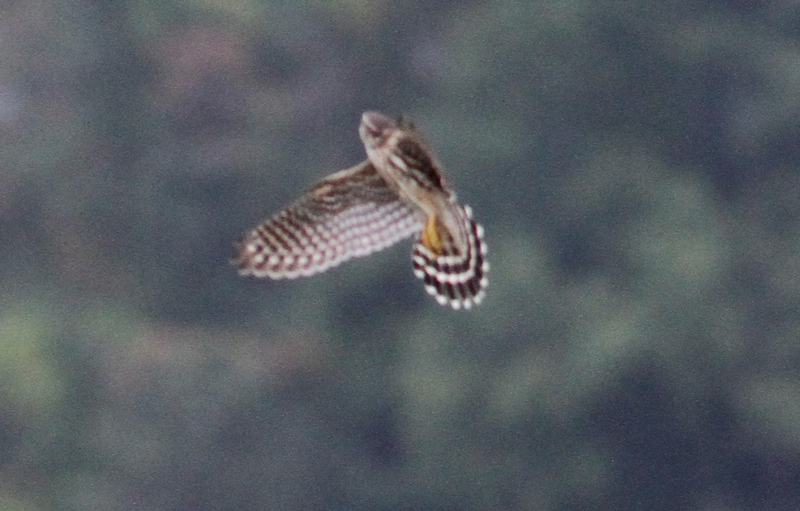 At dawn in the same area, I was surprised to hear an American Woodcock roding along with three calling Swainson's Thrushes and a Rusty Blackbird. 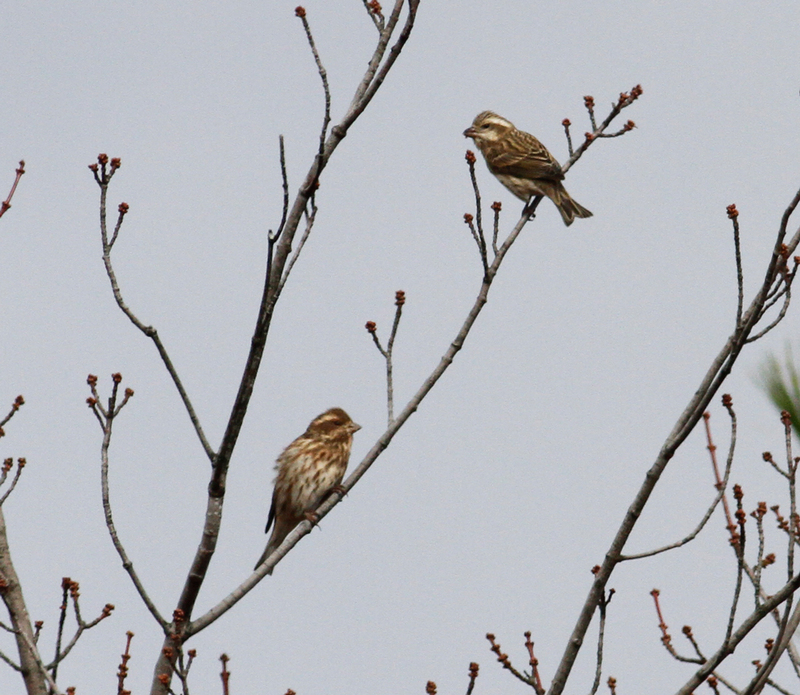 Yellow-rumped Warblers - North Cross Road, Gill, Franklin Co., MA. October 11th, 2016. 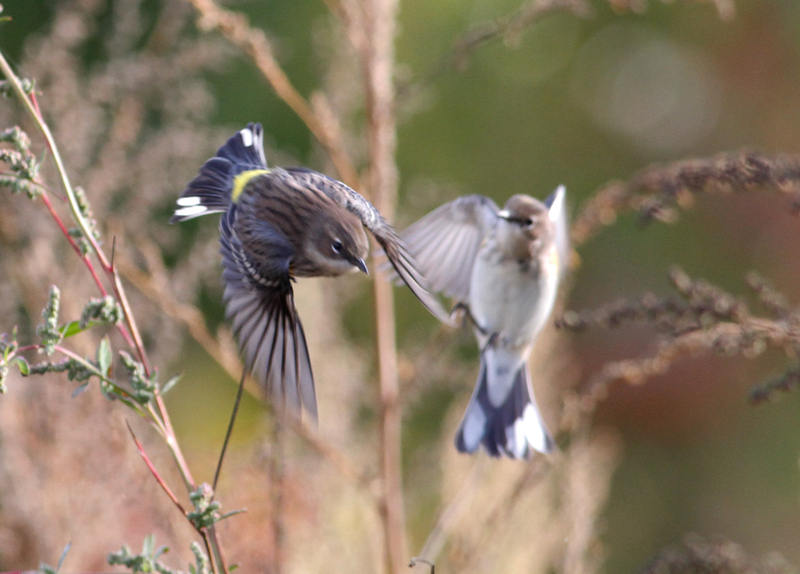 Yellow-rumped Warblers - River Road, Gill, Franklin Co., MA. October 13th, 2016. Impressive numbers working the field edges and woodland fringe in Gill. 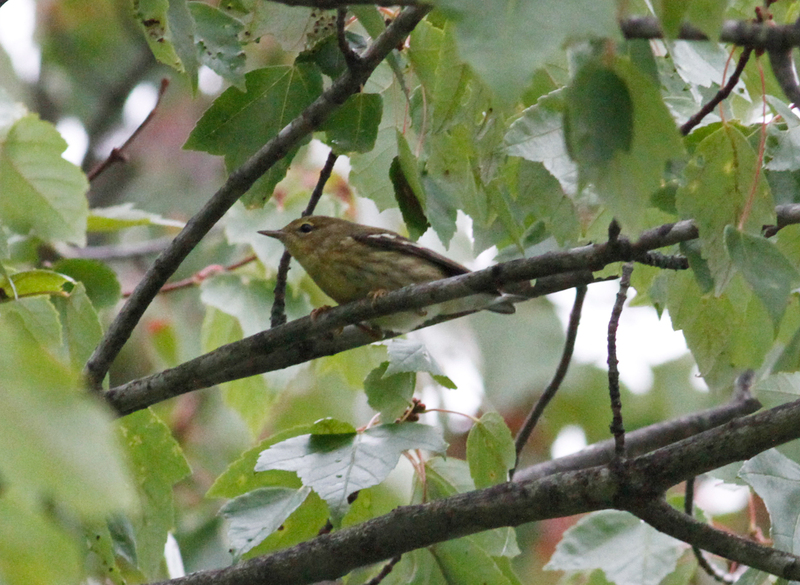 Blackpoll Warbler - juv/first-winter, North Cross Road, Gill, Franklin Co., MA. October 11th, 2016. Savannah Sparrow - North Cross Road, Gill, Franklin Co., MA. October 11th, 2016. 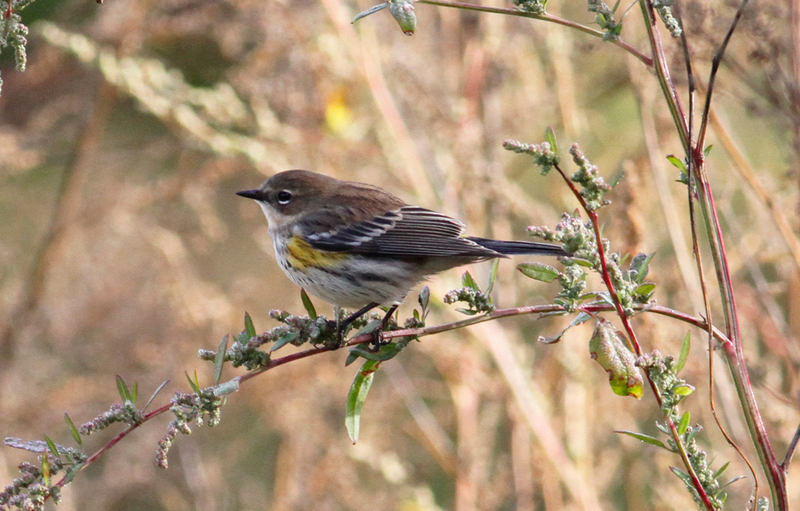 Abundant migrant in Gill/Northfield in mid-October. Yellow-bellied Sapsucker - juv/first-winter, Caldwell Road fields, Northfield, Franklin Co., MA. October 12th, 2016. 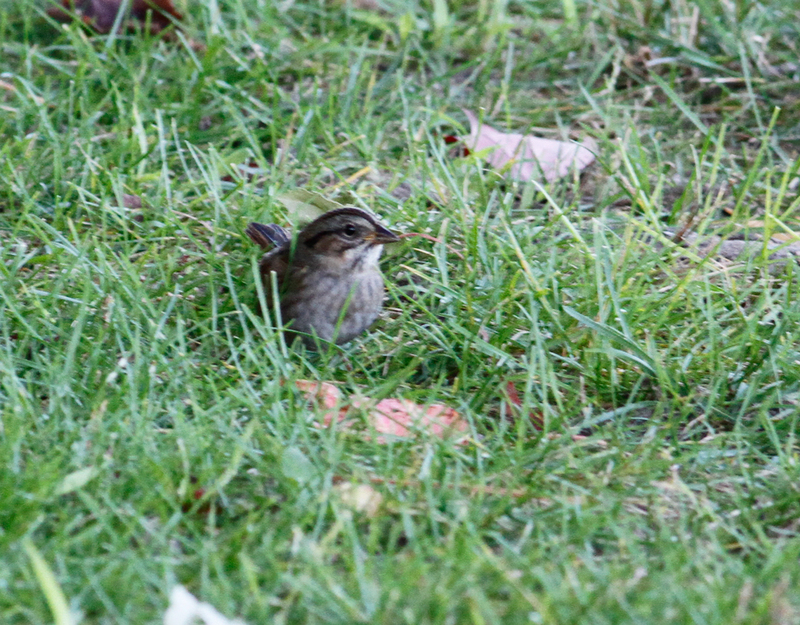 Swamp Sparrow - Caldwell Road fields, Northfield, Franklin Co., MA. October 12th, 2016. October 12th saw me taking a look at the fields to the north-east of the Northfield transfer station along Caldwell Road. 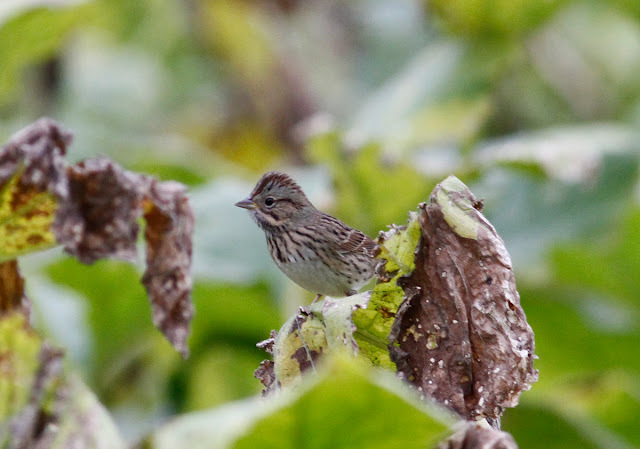 Although I rarely bird this area, it's often productive when I do and the morning of the 12th was no exception, again producing hundreds of sparrows, mainly Song, Swamp, Savannah and White-throated but also two or three immature White-crowned Sparrows. There was also a 'getting-late' Bobolink, and another Rusty Blackbird giving its characteristic call as it flew north. 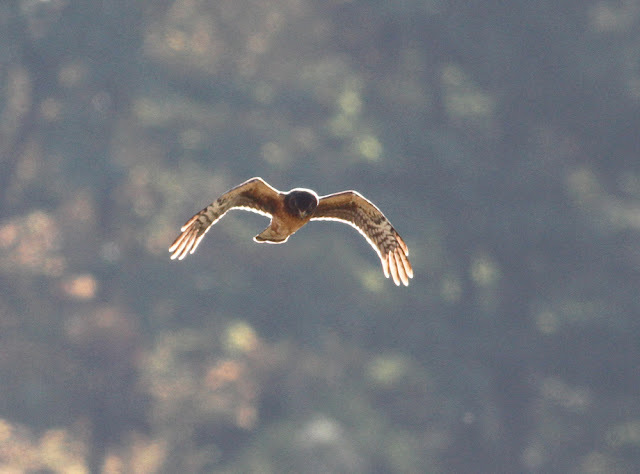 A juvenile Northern Harrier was a real treat as it worked the fringes of the dirt roads, seemingly oblivious to me standing only meters away. A Yellow-bellied Sapsucker also joined the fun, in fact single sapsuckers have been showing up in most of the spots that I've looked at in the last few days including; North Cross Road, Gill Elementary School, and River Road in Gill, and Unity Park in Turner's Falls. Rusty Blackbird - Caldwell Road fields, Northfield, Franklin Co., MA. October 12th, 2016. A brief stop on River Road, Gill on the 13th saw much the same species profile but with increased numbers of Ruby-crowned and Golden-crowned Kinglets. The Ruby-crowneds seemed quite happy foraging along the field edges and sometimes even in the crops themselves, but the Golden-crowneds were much more tied to woodland. 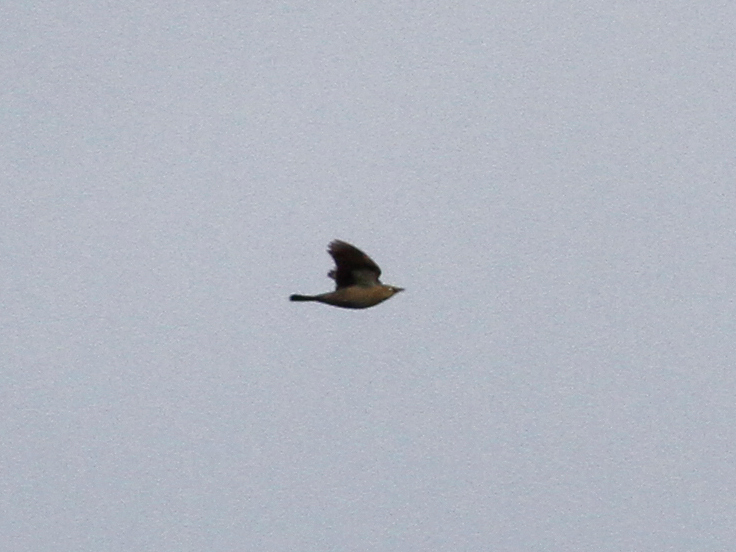 Late migrants here included Northern Parula and Red-eyed Vireo and an American Pipit flew over. 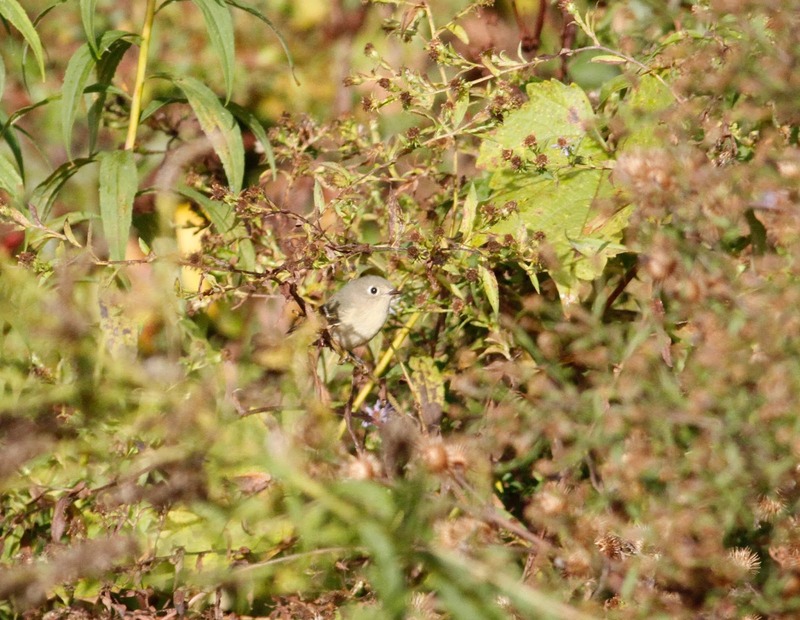 Ruby-crowned Kinglet - River Road, Gill, Franklin Co., MA. October 13th, 2016. About five or six along River Road fields this morning. Northern Goshawk (juvenile) and Common Raven - Putney Mountain Hawkwatch, Windham Co., VT. October 10th, 2016. October 10th brought a welcome (and steep!) drop in temperatures with a cool air mass bringing stiff north-westerly winds. 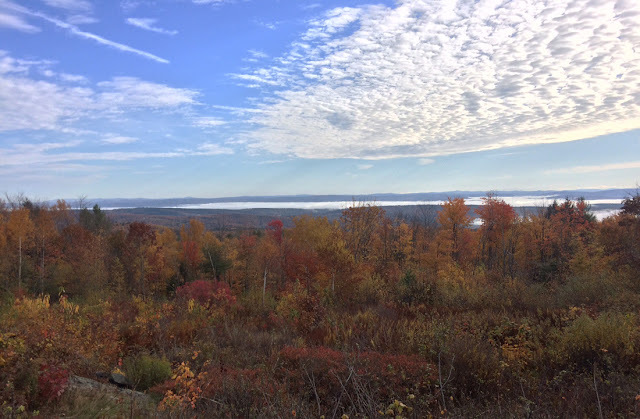 The conditions seemed ripe for a good movement of geese and raptors, and so we headed north to visit the dedicated hawkwatch at Putney Mountain in southern Vermont. 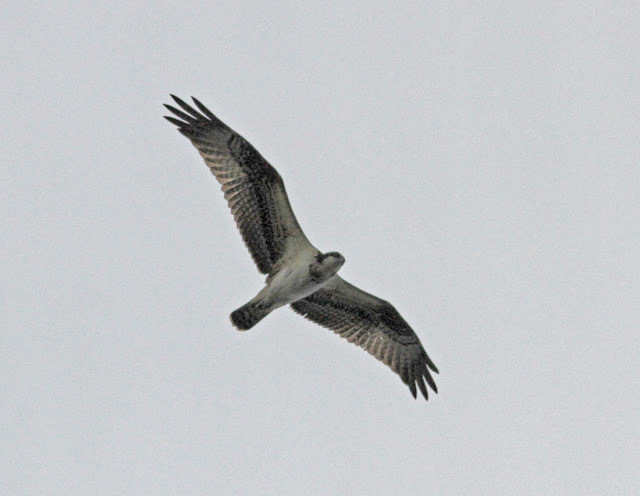 The signs for a good day were already in place as, during the previous evening, I tallied no less than seven Ospreys at Turner's Falls in just 25 minutes, and that included four in the air at the same time! The birds were lifting from the forest edge on clearing weather conditions after a day of solid rain. Such high counts of Ospreys are pretty unusual at Turner's Fall in my experience. Osprey (juvenile) - Unity Park, Turner's Falls, Franklin Co., MA. October 9th, 2016. 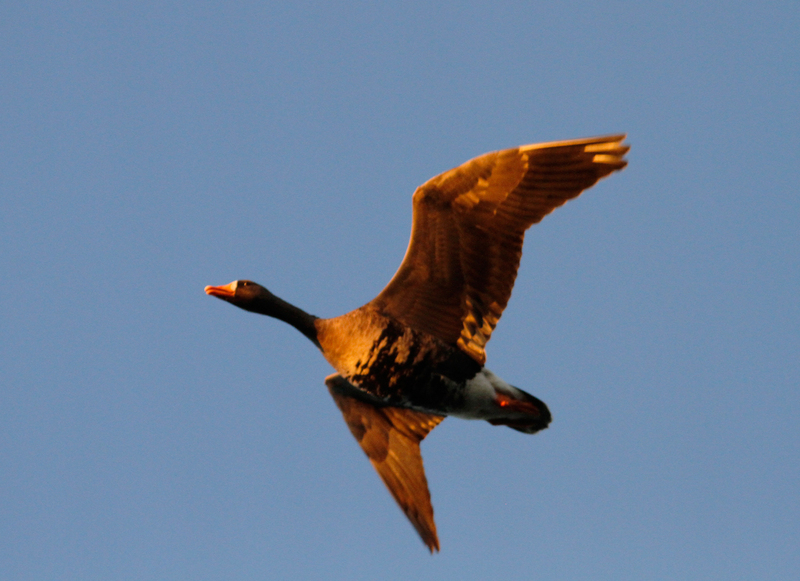 One of the seven seen during a surprising evening flight after a day of rain. 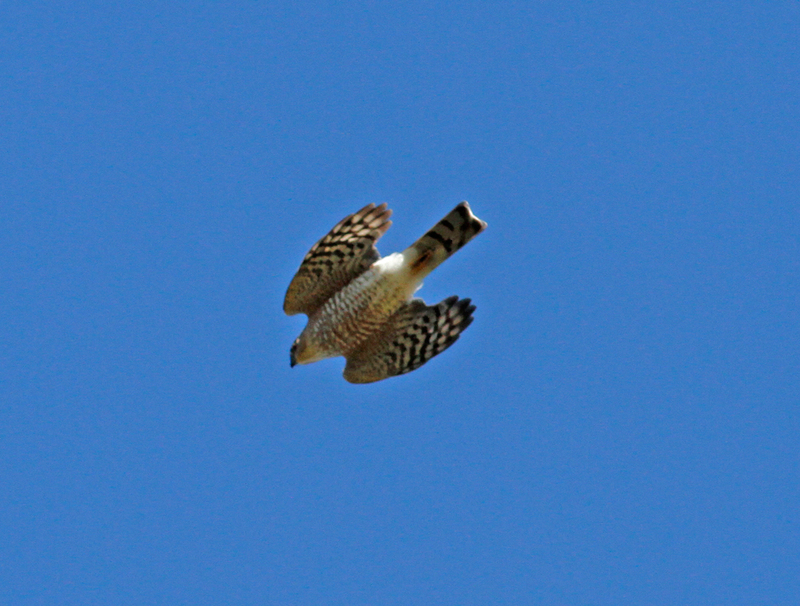 Arrival at Putney Mountain was greeted by a bracing north-westerly and smattering of raptors shooting through at high speed, most of them Sharp-shinned Hawks. 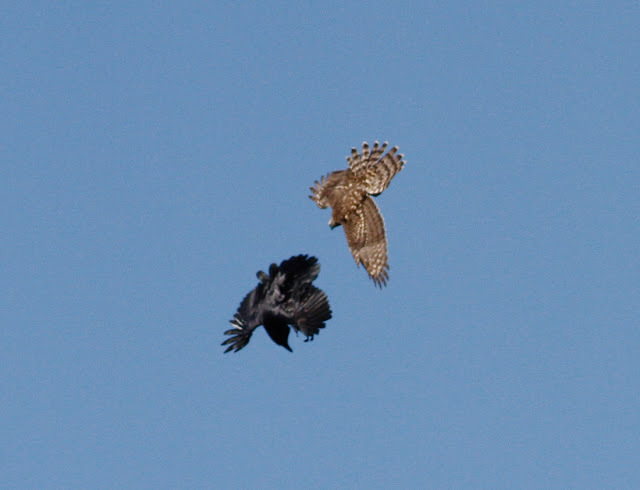 However, we hadn't been there too long before a Common Raven began sparring with a juvenile Northern Goshawk just in front the station. I was thrilled. Northern Goshawks are like 'hens teeth' in Massachusetts in my experience and usually I don't get to see them every year. To have a smart hatch-year bird in front of us offering good photo opportunities was a treat indeed. 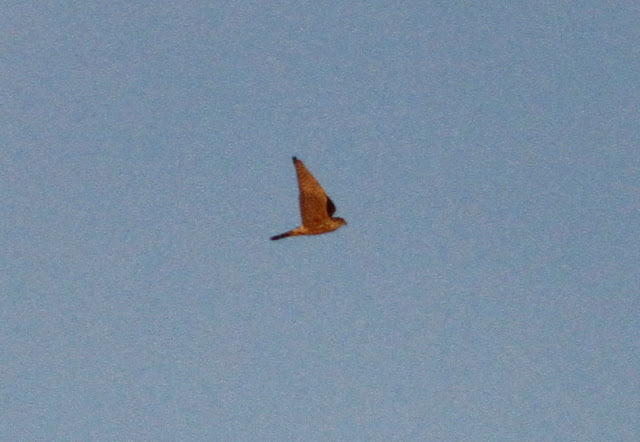 As if that wasn't enough, a crisp adult Goshawk passed steadily over the station followed by another sighting of a young bird, so two or three Northern Goshawks in all leaving me highly satisfied with the morning. But there was more to come......just after 11;25am, Don Clark picked out an odd looking large bird disappearing behind the tree line but he'd seen enough to suggest that it might be a crane. Sure enough, a Sandhill Crane appeared from behind the maples heading west before hitting a thermal and soaring almost directly above the hawkwatch before continuing west once more - just awesome! Northern Goshawk (juvenile) - Putney Mountain Hawkwatch, Windham Co., VT. October 10th, 2016. 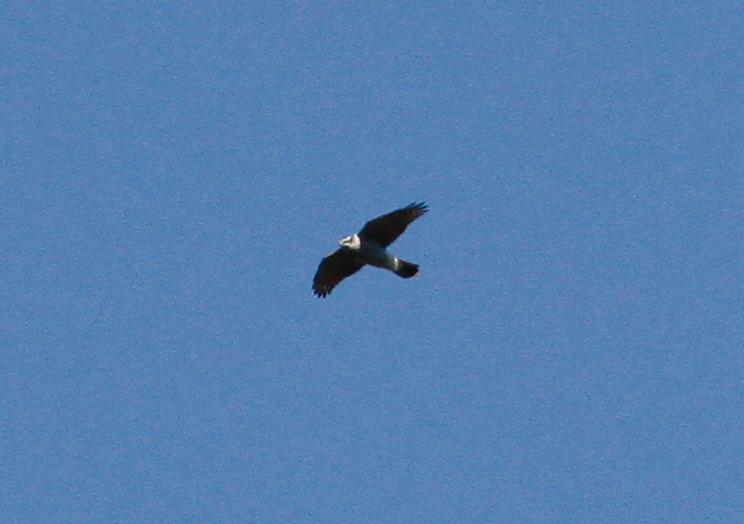 Northern Goshawk (adult) - Putney Mountain Hawkwatch, Windham Co., VT. October 10th, 2016. 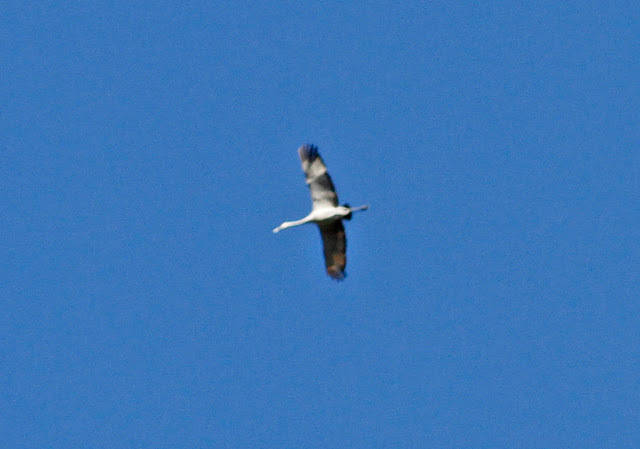 Sandhill Crane - Putney Mountain Hawkwatch, Windham Co., VT. October 10th, 2016. With some reluctance, we left the station at about 1:15 pm with some nice diversity though not too much in the way of volume; Cooper's Hawk, Sharp-shinned Hawk, Red-tailed Hawk, Red-shouldered Hawk, Peregrine, American Kestrel, and Turkey Vulture were all recorded in addition to the previously mentioned Goshawks. 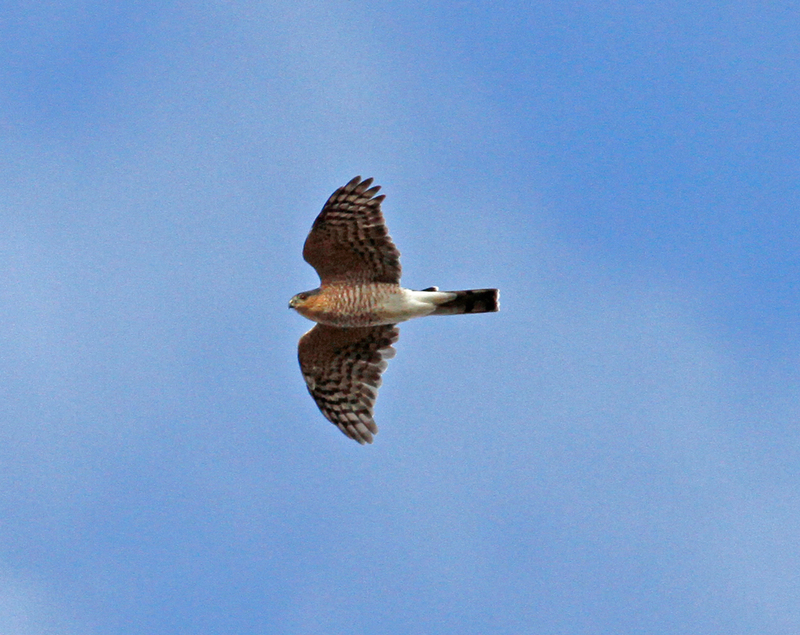 Sharp-shinned Hawk - Putney Mountain Hawkwatch, Windham Co., VT. October 10th, 2016. The most abundant migrant raptor of the day. Red-shouldered Hawk - Putney Mountain Hawkwatch, Windham Co., VT. October 10th, 2016. 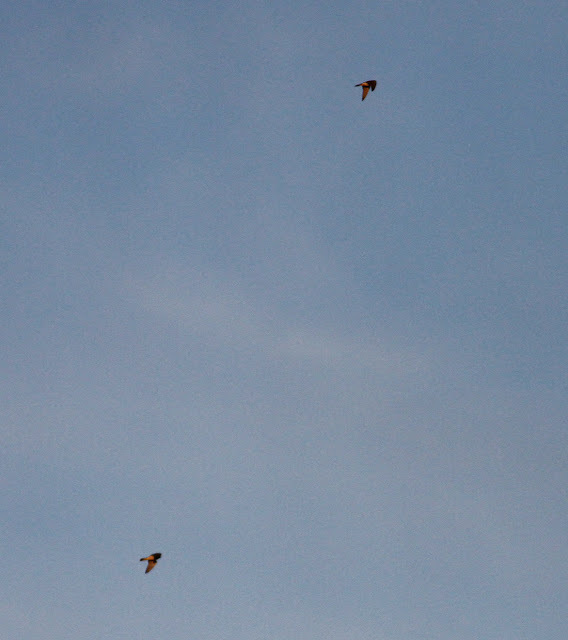 Two seen in the air at the same time, though not quite together - one adult-type, one juvenile. In late afternoon, the north-west wind was still raging and a timely check of Barton Cove from Turner's Falls was very birdy indeed producing four Ring-necked Ducks, two male Black Scoters, one female Surf Scoter, one male American Wigeon as well as the long staying Pied-billed Grebe and Gadwall. And active migration was still taking place right through to end of the day with a juvenile Northern Harrier drifting south over Unity Park, and a Cackling Goose migrating south with Canada Geese as if to compliment the two Greater White-fronted Geese found by Eric Huston earlier in the day - quite a day in the end! 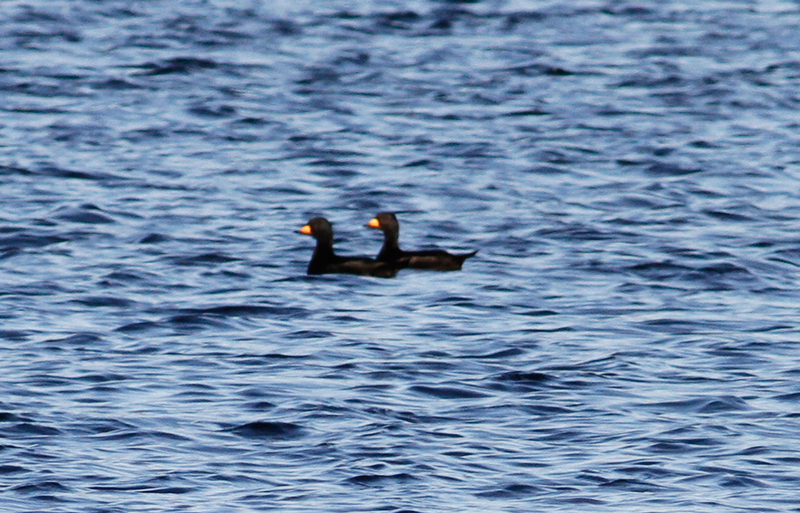 Black Scoters (males) - Unity Park, Turner's Falls, Franklin Co., MA. October 10th, 2016. 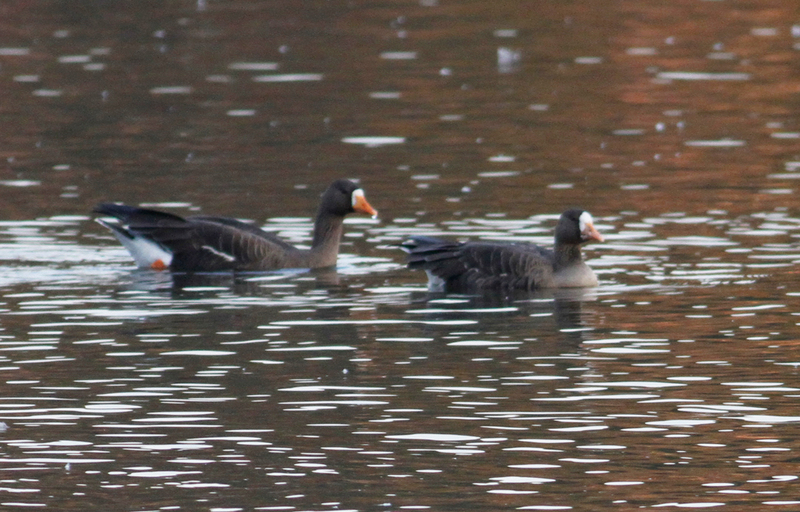 Greater White-fronted Geese (with Canada Goose) - Turner's Falls, Franklin Co., MA. October 11th, 2016. Found by Eric Houston on October 10th and still present on the 11th when this image was taken. MA - early October bonanza! 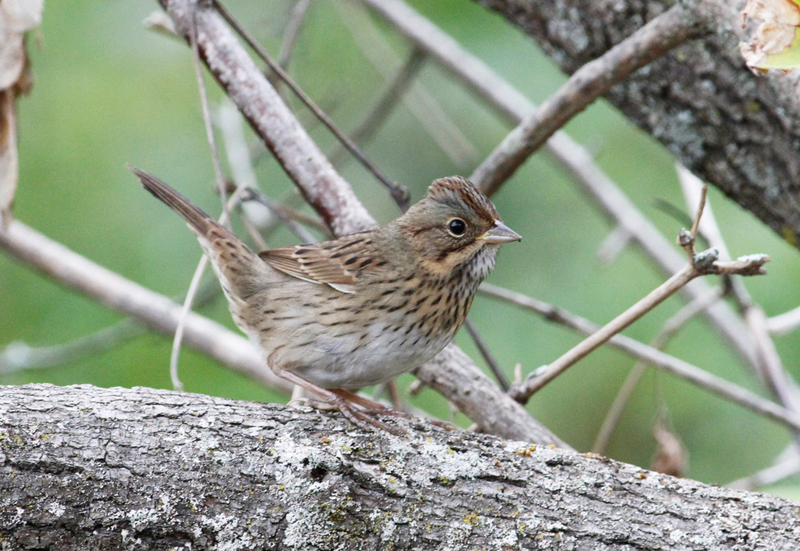 Lincoln's Sparrow - Caldwell Road, Northfield, Franklin Co., October 4th, 2016. 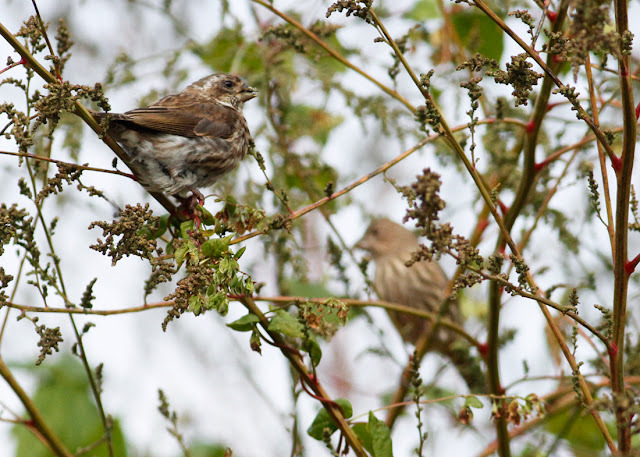 Bird-wise, the first week of October has been rich indeed in terms of volume and diversity. 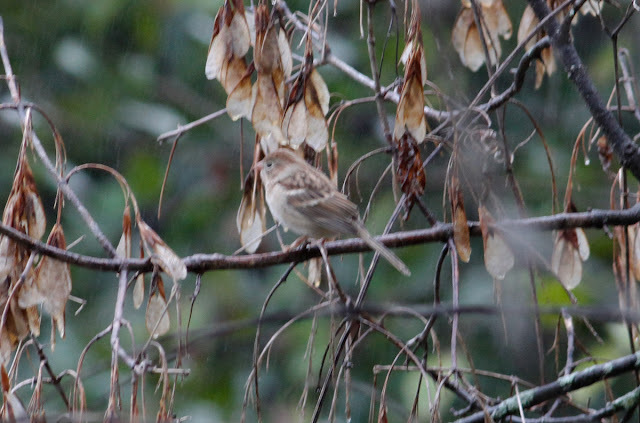 Dull, heavily overcast conditions (often accompanied by heavy rain) and winds in the northern quarter persisted for the first four days of the month littering the the fields and woodland fringes with hundreds of migrants including a major incursion of White-throated, Song, Savannah and Swamp Sparrows. As always, it was difficult to develop a firm grasp of numbers but the pumpkin fields on North Cross Road, Gill and Caldwell Road, Northfield supported hundreds of sparrows for several days in succession. 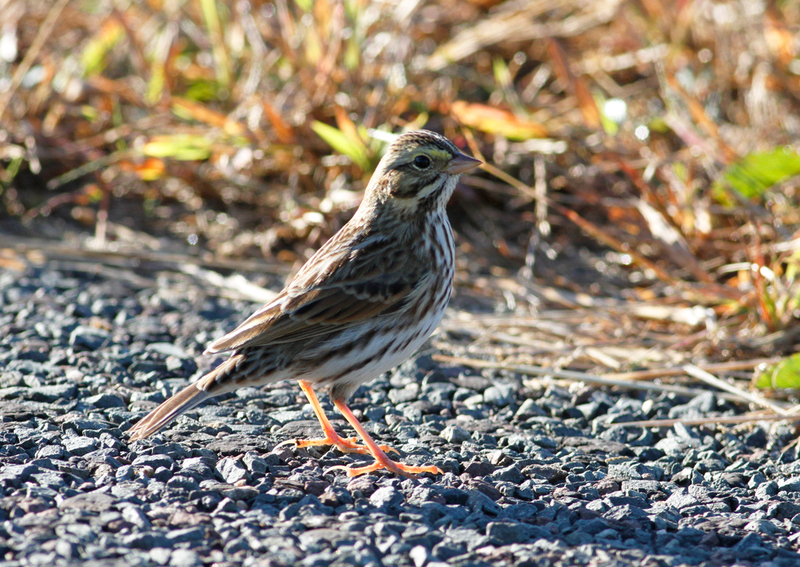 Among them, a smattering of scarcer species such as Lincoln's, Field and White-crowned Sparrows and the odd Indigo Bunting. Lincoln's Sparrow - North Cross Road, Gill, Franklin Co., October 3rd, 2016. Field Sparrow - Caldwell Road, Northfield, Franklin Co., October 1st, 2016. Warblers have been scarce with Yellow-rumped and Palm Warblers being the only 'common' species, as might be expected for early October but Blackpoll Warblers have been present at most sites that I've visited along the Connecticut River between Deerfield and Northfield as well as a tiny handful of Black-and-white, Tennessee, Nashville and Black-throated Green Warblers. 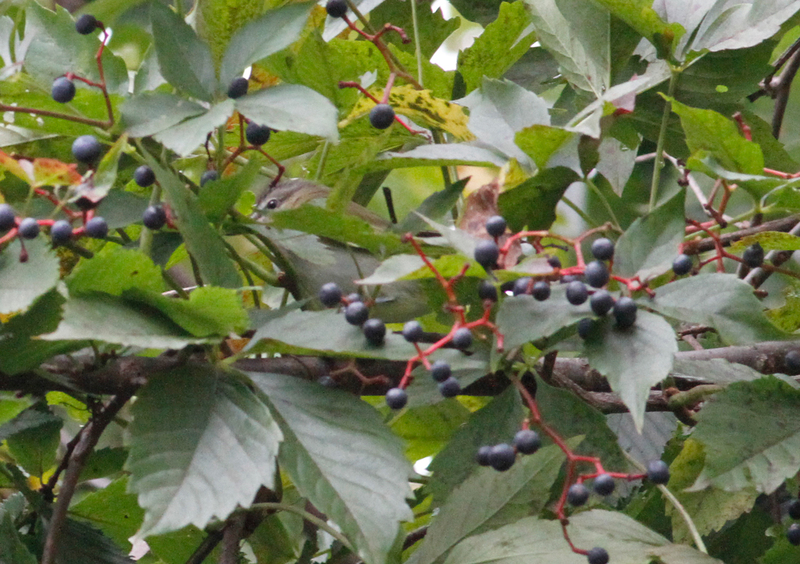 Prize among the warblers, however, would have to be a late Connecticut Warbler at the Arcadia Wildlife Sanctuary in Easthampton on the 5th. Susannah and I worked hard to get a mere sniff of this aloof and much prized migrant but we were eventually rewarded with unambiguous views and calls.....I'm still in the process of checking my images but it looks like the little devil may have eluded the camera! Blackpoll Warbler - Unity Park, Turner's Falls, Franklin Co., October 2nd, 2016. Barton Cove has been relatively quiet compared to previous years with a continuing molting Gadwall, American Coot and the odd Ring-necked Duck and Green-winged Teal being the only waterbirds of note. 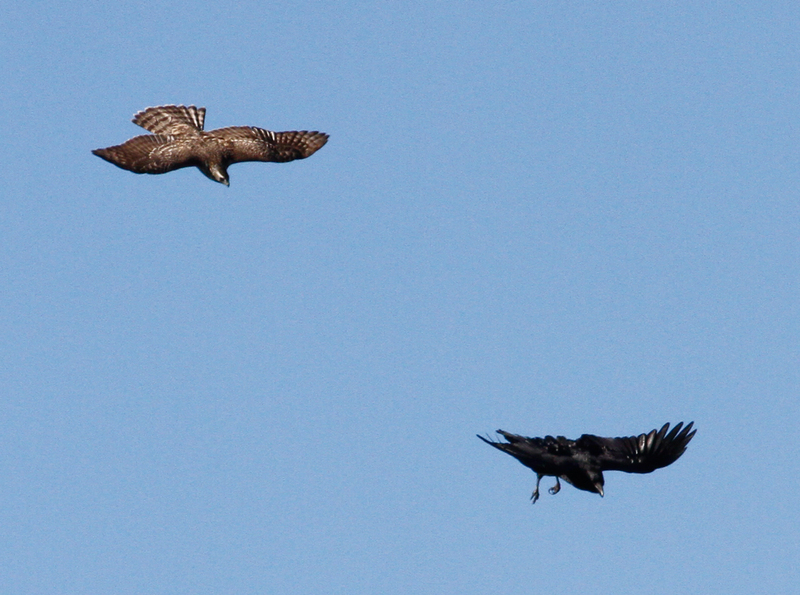 Raptors have been more impressive with up to eight Bald Eagles in the area and three Black Vultures on the 3rd. Gadwall - eclipse drake, Unity Park, Turner's Falls, Franklin Co., October 3rd, 2016. 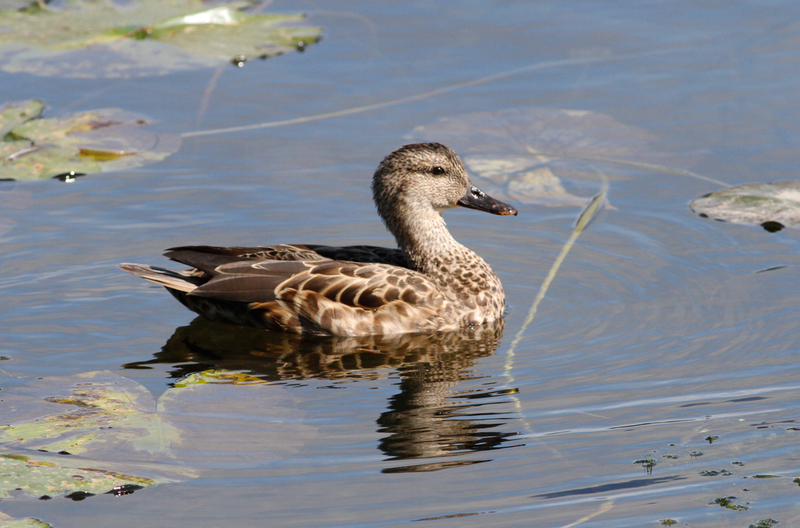 Continuing bird from late August after being first found by Eric Huston. Almost certainly the same male that summered at Unity Park and Barton Cove in 2015. 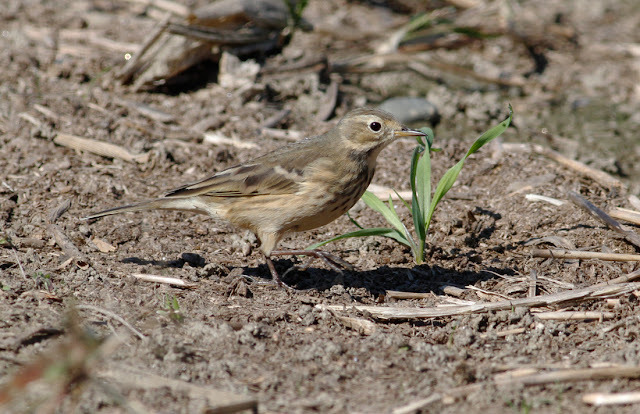 And today (Oct 6th), the fields north of Old Deerfield hosted some very close American (Buff-bellied) Pipits with at least 110 rising up whenever two local Peregrines cruised over the fields. It was certainly a treat to get that close to foraging pipits. 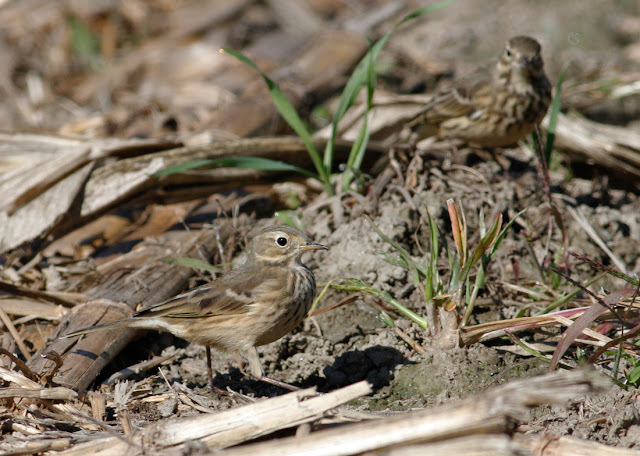 American (Buff-bellied) Pipits - Old Deerfield, Franklin Co., October 6th, 2016. 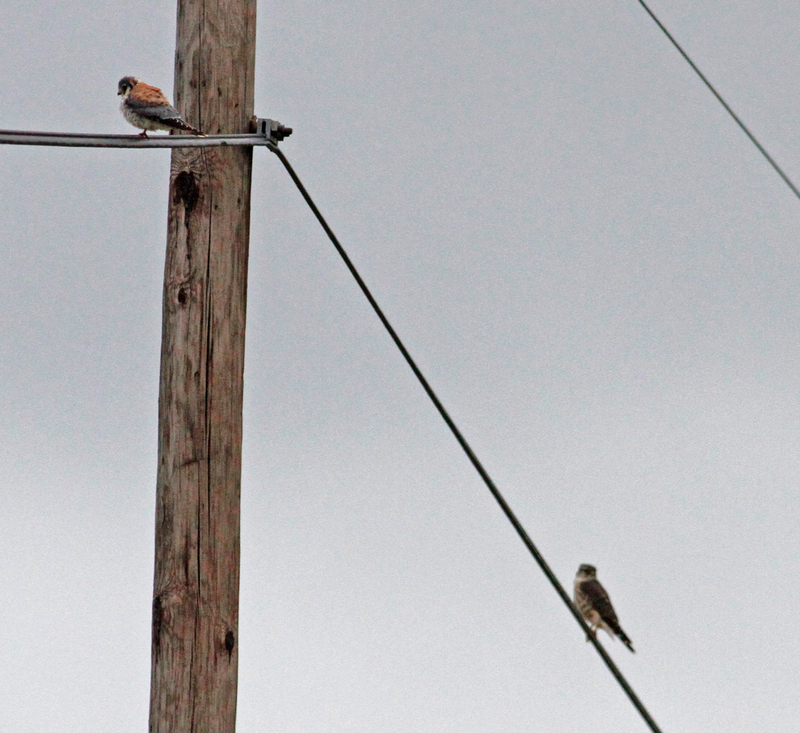 American Kestrel (front) and Merlin - Caldwell Road, Northfield, Franklin Co., October 4th, 2016. American Kestrel (right) and Merlin - Caldwell Road, Northfield, Franklin Co., October 4th, 2016. 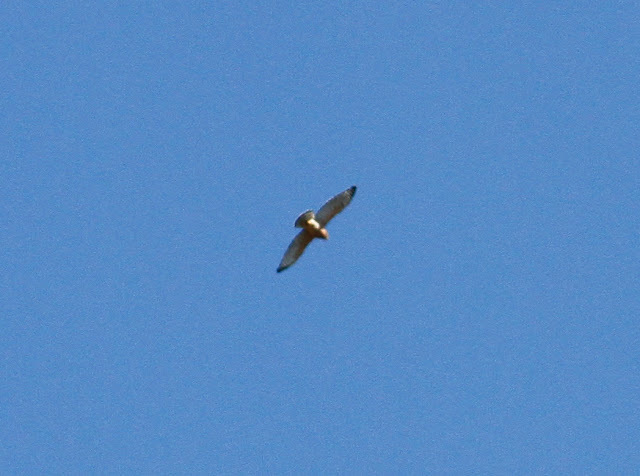 Merlin - Caldwell Road, Northfield, Franklin Co., October 4th, 2016. Purple Finch with House Finch (rear) - Old Deerfield, Franklin Co., October 6th, 2016. Purple Finch - Old Deerfield, Franklin Co., October 6th, 2016.
them at all the sites I visit, at least for the time being! Scarlet Tanager (female-type)- Gill Center, Franklin Co., October 5th, 2016. 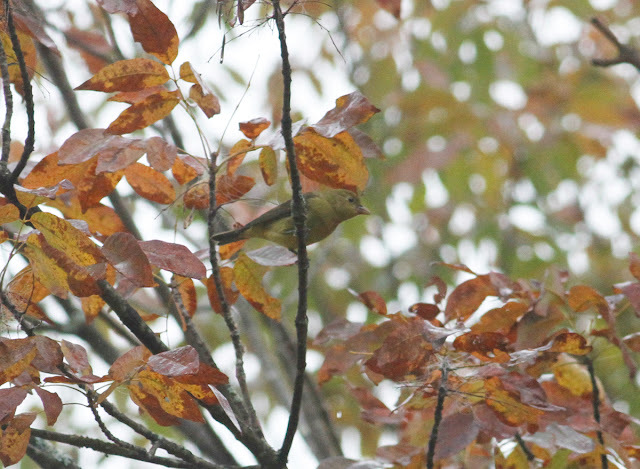 Red-eyed Vireo - Unity Park, Turner's Falls, Franklin Co., October 2nd, 2016. Small numbers still passing through in early October. 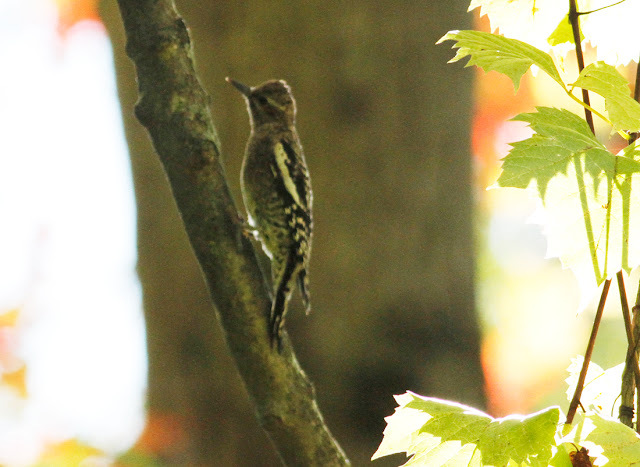 Yellow-bellied Sapsucker - Arcadia Wildlife Sanctuary, Easthampton, Hampshire Co., October 5th, 2016. 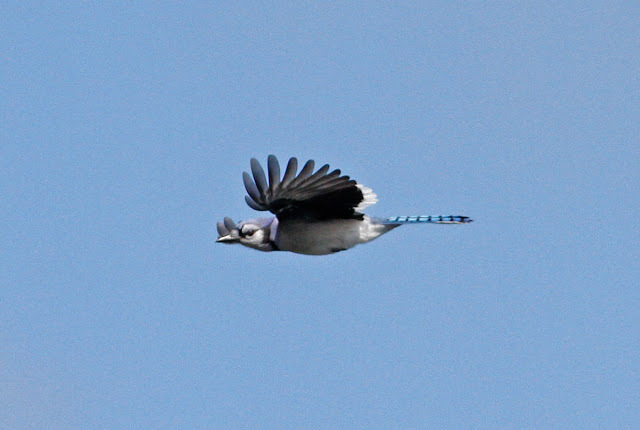 Blue Jays - Unity Park, Turner's Falls, Franklin Co., October 3rd, 2016. Several large wave of Blue Jays passing south on the 3rd with over 400 birds recorded in just one hour. 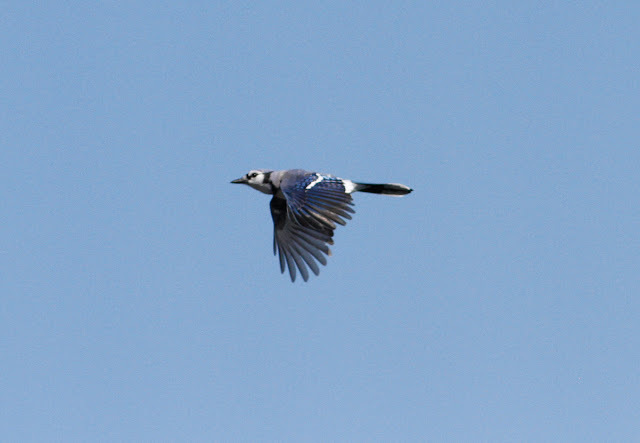 Blue Jays - migrants seen from Unity Park, Turner's Falls, Franklin Co., October 3rd, 2016.